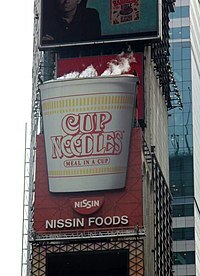 Close-up of a Times Square advertisement for Cup Noodles. Notice the actual steam rising from the cup. This is a list of instant noodle brands. Instant noodles are a dried or precooked noodle block, usually sold with a packet of flavoring powder and/or seasoning oil. 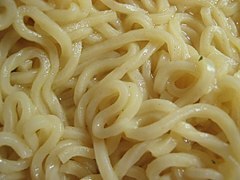 Dried noodles are usually eaten after being cooked or soaked in boiling water, while precooked noodles can be reheated or eaten straight from the packet. The instant noodle was invented by Momofuku Ando of Nissin Foods in Japan. They were launched in 1958 under the brand name Chikin Ramen. Ansungtangmyun Nongshim Brand of ramyeon produced in South Korea since 1983, and is the third highest-selling brand of noodles in South Korea as of 2014. Buldak Bokkeum Myun Samyang Food Produced in South Korea since 2012, and also sold overseas, Buldak Bokkeum Myun is known for being one of the spiciest ramyeon brands in Korea. Cham-ggae Ramyeon Ottogi A type of ramyeon sold in South Korea, the contents of the ramyeon are unique; it consists of a dried noodle block, seasoning, oil, sesame, and an "egg block" of egg and vegetables. It is served both in a cup and a "bag." Chapagetti Nongshim Produced in South Korea since 1984. Chapagetti is the first instant Jajangmyeon in South Korea and is the second highest-selling brand of noodles in South Korea. Chicken Ramen Nissin Foods Instant noodles were invented by Taiwanese-Japanese inventor Momofuku Ando in Japan, and his invention was first marketed on 25 August 1958 by Ando's company, Nissin, under the brand name Chikin Ramen. Also referred to as Nissin Chikin Ramen, it remains popular in Japan. Ching's Secret Capital Foods An Indian brand of Indian Chinese cuisine ingredients, condiments and ready to eat meals. Ching's Secret is owned by the corporation Capital Foods. Cup Noodles Nissin Foods Instant ramen, and the first to be exported from Japan, by Nissin Foods starting in 1971, bearing the name "Oodles of Noodles". One year later, it was re-branded "Nissin Cup Noodles" and packaged in a foam food container. Currently the largest instant noodle brand in Japan and sold in around 80 countries. Branded in China as Hé wèi dào, with the "Homestyle" brand also sold in the United States. Demae Iccho Nissin Foods Demae Ramen or Demae Itcho was first introduced in Japan in 1969 and entered the market in Hong Kong the next year, where as of 2016 it has market share of approximately 60% of ramen, with "original Japanese style" and other flavors catered for the region. Doll Instant Noodles Winner foods Popular in Hong Kong and Southern China. Doshirak Korea Yakult (Paldo) A brand of ramyeon produced in South Korea since 1986. It has also become a popular brand in Russia. Kabuto Noodles Advertised as the UK's first "up-market" instant noodle brand. Koka Instant Noodles Tat Hui Foods Manufactured in Singapore, sold domestically and internationally. Lucky Me! Monde Nissin Lucky Me! is a Filipino brand that initially featured dry stir-fried noodles, and later expanded to making instant mami and other instant Filipino noodle dishes. Mamee Chef Mamee Double-Decker MAMEE Chef is a Malaysia brand and also now an internationally recognized consumer good through its award as one of the Top 10 Instant Noodles of All Time 2014. In its quest to create the perfect flavor, MAMEE teamed up with renowned Malaysian celebrity chef, Chef Ismail. Together, MAMEE and Chef Ismail have created an original, authentic recipe made with fresh ingredients, herbs and spices that caters to many unique local flavors. Mivina Mivina Brand popular in Russia, Ukraine, Belarus and the Baltic states. Mr Lee's Noodles Mr Lee's Pure Foods Co. 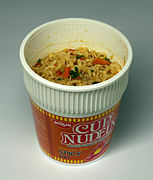 Brand of premium noodles in a cup in United Kingdom and Australia using freeze-dried ingredients. Certified low in sugar by Sugarwise and gluten free by Coeliac UK and Coeliac AU. Sold domestically and internationally online, through airlines and train lines and through digital vending machines (Noodle Kiosks). The Nation's Noodle Symington's (Golden Wonder) The product was launched in the United Kingdom on 3 August 2009. As of February 2016, it was rebranded Noodle Pot. Neoguri Nongshim A brand of ramyeon produced in South Korea since 1982. It is exported to over 80 different countries, and is the fourth highest selling brand of noodles in South Korea. Paldo bibim men Korea Yakult (Paldo) A brand of brothless ramyeon (ramen) with sweet and spicy seasoning sauce to mix with noodles, produced since 1984. It is the oldest brothless ramyeon in Korea. In 2013, Paldo bibim men was the tenth-ranked for ramyeon sales in South Korea, with revenues of 47 billion won that year. Patanjali Atta Noodles Patanjali Ayurved An Indian brand of Instant noodles made from wheat. Penang White Curry Instant Noodle Nyor Nyar Curry Brand of instant noodle from a company originating in Malaysia, VJ Foodstuff Import & Export Sdn Bhd, which owns the Nyor Nyar Curry brand. Also a vegetarian version on the market. Prima Taste Prima Food Prima Taste instant noodles are a premium brand of noodles. Rollton Rollton Brand popular in Russia, Ukraine, Belarus and the Baltic states. Sapporo Ichiban Sanyo Foods A brand of instant noodles with varieties such as ramen and instant yakisoba, Sapporo Ichiban has found a market outside its origin in Japan, most notably with consumers in Hong Kong, the United States, Mexico, Argentina and Canada. Sarimi Indofood Sukses Makmur Brand by Indofood in Indonesia. Smith & Jones instant noodles Capital Foods Ltd, India Brand of instant noddles manufactured in India for domestic distribution and export. Supermi Indofood Sukses Makmur An early instant noodle in Indonesia introduced in the 1970s by Indofood Sukses Makmur in Indonesia. Top Ramen Nissin Foods Sold in the United States starting in 1972, in Nissin's first foray overseas. Yatekomo Gallina Blanca (under license of Ajinomoto Group) Manufactured and sold in Spain starting in 2014. Shin Ramyun is often eaten with kimchi as a topping or on the side. ^ a b VIR, Vietnam Investment Review- (22 November 2017). "Vietnam's instant noodle giants". Vietnam Investment Review - VIR. Retrieved 9 January 2019. ^ a b c Kim, Kyung-moo (20 December 2014). "South Korea found the most ramen-eating country". Hankyoreh. Retrieved 2015-09-22. ^ Ko, Dong-hwan (3 March 2014). "Korean ramen war now 'broth-less'". Korea Times. Retrieved 2015-09-22. ^ Shin, Jeana (16 January 2015). "Samgyang Food's "Fire Noodles" Become Popular Overseas". Business Korea. Retrieved 2015-09-22. ^ "Samgyang Food's "Fire Noodles" Become Popular Overseas". Business Korea. Retrieved 13 July 2016. ^ "Super Spicy Korean Noodles (Buldak Bokkeum)". Modernseoul.org. Retrieved 13 July 2016. ^ "Bag". Ottogi.co.kr. Retrieved 19 July 2016. ^ "Container". Ottogi.co.kr. Retrieved 19 July 2016. ^ a b c d e f g "Brands". Nissin.com. Retrieved 16 May 2017. ^ "makanai, demae, shidashi | Japanese-English dictionary". EUdict. Retrieved 2012-11-17. ^ "Japan's Demae Ramen Rocks in Hong Kong". japanstyle.info. Feb 6, 2010. Retrieved 28 October 2012. ^ a b "The ten most purchased brands in the world". independent.co.uk. Retrieved 30 December 2016. ^ Lienesch, Hans. "Tag Archives: Anderson Watts". The Ramen Rater. Retrieved 2016-10-11. ^ "Products » Mr Noodles 85g". Beltek (Huizhou) Foods Co., Ltd. Retrieved 2016-10-11. ^ "Golden Wonder launches The Nation's Noodle". Talking Retail. 29 July 2009. Retrieved 9 September 2009. ^ Kemp, Ed (24 July 2009). "Golden Wonder to take on Pot Noodle with 'The Nation's Noodle'". Marketing. Retrieved 9 September 2009. ^ "45억 개… 맛으로 쌓은 30년 사랑". DongA Ilbo. 3 May 2012. Retrieved 2015-09-22. ^ "PalDo". Paldofood.com. Retrieved 16 May 2017. ^ Won, Sungyeal (1 January 2015). "2014년 국내 라면시장 규모 1조 9700억원대". DongA Ilbo. Retrieved 2015-11-28. ^ Ko, Dong-hwan (3 March 2014). "Korean ramen war now 'broth-less'". Korea Times. Retrieved 2015-11-28. ^ "Buy Penang White Curry Instant Noodle". Nyornyarcurry.com. Retrieved 16 May 2017. ^ "Buy Vegetarian Penang White Curry Instant Noodle". Nyornyarcurry.com. Retrieved 16 May 2017. ^ Lam, Lydia (17 April 2018). "Prima Taste Singapore Laksa tops Ramen Rater's list for the 3rd year in a row". Straits Times. ^ "브랜드관 | 농심". Brand.nongshim.com. Retrieved 2016-06-08. ^ "Smith & Jones - About Us". Smith-n-jones.com. Retrieved 11 December 2014. ^ "ไวไว - บริษัท (Article in Thai)". waiwai.co.th. Retrieved 2019-04-03. This page was last edited on 3 April 2019, at 09:20 (UTC).